This wiki page is all about AirDrop, including AirDrop basics guide (turn on and set up AirDrop, use AirDrop to send content), AirDrop features and tips for sending items and more. AnyTrans – A Quick Way to Transfer Files from iPhone to Mac/Windows. Simply download AnyTrans to transfer music, photos, contacts etc. from iOS devices to computer before reading this guide. 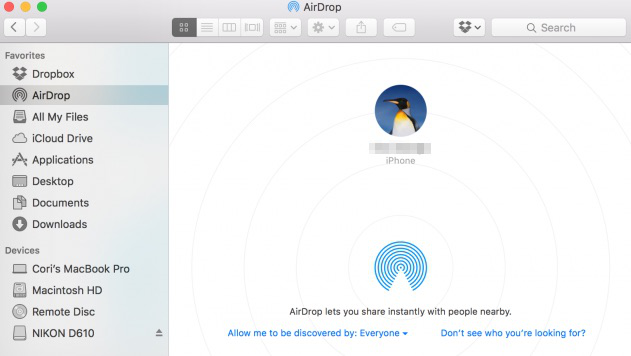 AirDrop is an ad-hoc service in Apple's OS X and iOS operating systems, introduced in Mac OS X Lion (OS X 10.7) and iOS 7, which enables to transfer files from iDevice to Mac computer and transfer files from Mac to iDevice without using mail or a mass storage device. With AirDrop, people can wirelessly send items like photos (Learn: how to transfer photos from iPhone to Mac), videos (Learn: how to Transfer Videos from iPhone to iPhone), websites, locations, and more to a nearby iPhone, iPad, iPod touch, or Mac. To send items to an iPhone, iPad, or iPod touch, or to receive items from those devices, Apple users need a 2012 or later Mac model with OS X Yosemite or later, excluding the Mac Pro (Mid 2012). Choose Go > AirDrop from the menu bar in the Finder. An AirDrop window opens. If Bluetooth or Wi-Fi is turned off, users will see a button to turn it on. 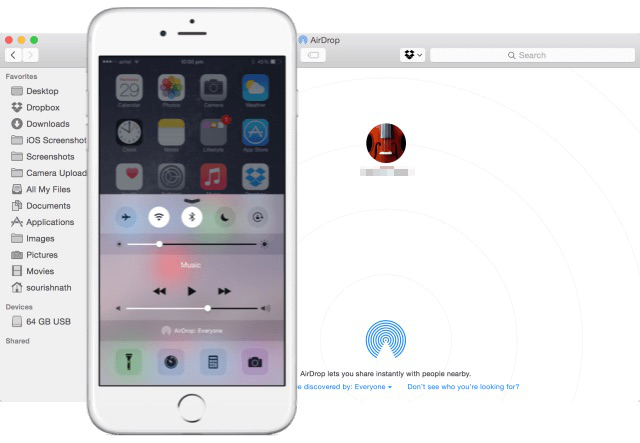 AirDrop turns on automatically when Bluetooth and Wi-Fi are on. To receive files from everyone instead of only those in users' Contacts app, users can use the "Allow me to be discovered by" setting at the bottom of the AirDrop window. Open Control Center. Tap AirDrop, and then choose whether to receive items from everyone or only from people in users' Contacts app. Choose Go > Select AirDrop from the menu bar in the Finder. Or select AirDrop in the sidebar of a Finder window. 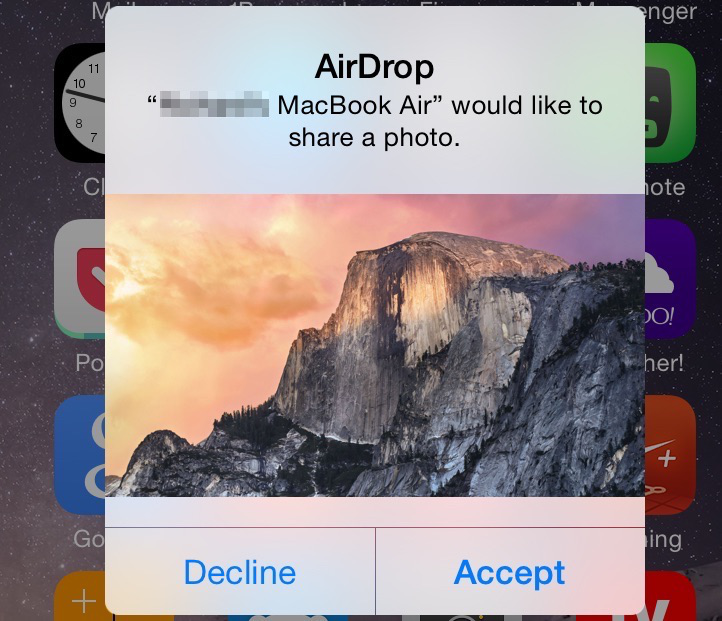 The AirDrop window shows nearby AirDrop users. Drag one or more items to the recipient's image in the window, and then click Send button. If the recipient is signed in to your iCloud account, the item you're sending is automatically accepted and saved. Otherwise, the recipient is asked to accept the item before it's saved to their device. On a Mac, the item is saved to the Downloads folder. On an iOS device, the item appears in the appropriate app. For example, photos (Learn: how to transfer photos from iPhone to iPhone) appear in the Photos app and websites appear in Safari. 1. Toggle Bluetooth and/or Wi-Fi off and back on to reset the connections. 2. Turn off Instant Hotspot to free up the Bluetooth and Wi-Fi connections. 3. Temporarily switch to Everyone to remove any chance of contact mismatch. If iOS devices aren't recognizing each other, make sure AirDrop is set to "Everyone" instead of "Contacts Only," as the latter setting has caused some problems for users. Apple users can also AirDrop a location from the Maps app, a contact (Lean: how to recover deleted contacts from iPhone without backup) from the Contacts app, an open document in Preview or other Apple apps, and so on.